Westin Resort now in Cape Coral, Lee County Florida: “Starwood Hotels & Resorts Worldwide, Inc. opened its Westin brand in Southwest Florida, in the prestigious waterfront community in Southwest Cape Coral.” Read more or book your trip here. 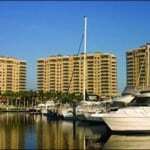 The Westin is part of the Tarpon Point Marina exclusive waterfront community. Tarpon Point Marina has luxury private homes and condos on the waterfront. The Tarpon Landings condominiums are uniquely designed: most units are over 3,000 square feet; private elevators take you to your private secured foyer; the front lanai (balcony) offers panoramic Caloosahatchee and Gulf of Mexico; the back lanai has gorgeous views of Southwest Cape Coral homes and canals; pool-side enclosed and air conditioned cabanas; and the amenities parallel high-end resort living, with large heated pool, fitness center, tennis, party rooms, and more. The marina offers deep saltwater boat slips for lease, either short or long term. Tarpon Estates is the gated community of single family executive homes that are on Direct Sailboat Access canals. Tarpon Gardens is a coach home gated enclave within Tarpon Point, offering large floor plans and enclosed two car garage for each unit.